Please send me more information on Outdoor Adventures! Hankering for a real High Sierra adventure in beautiful Baja? Nothing can match whipping across a stunning canyon at 200 feet on a zip line! The Outdoor Adventure is the true summit of high adventure, taking you on a series of thrilling canyon “flights.” You can test your nerve on the “Elevator,” and on an exciting 90-ft. rappel. Of course, our experienced guides will be there every wild whoosh of the way. After these soaring stunts, you can continue the exhilaration with an 700-ft zip line ride back to base camp, where you’ll have a chance to relax with snacks and drinks, shop for souvenirs, and just bask in the beauties of this UNESCO-protected canyon. Following the amazing Superman zip line, you'll hop into Polaris RZR off road UTV buggies and zoom off into the beautiful desert. These rugged and powerful vehicles are made for rough and tough off road conditions. You'll be lead through the desert by our guides on an exciting and fun course over sand, rocks and dusty roads and through dry riverbeds. This trill-a-second adventure is an awesome way to end an awesome tour. Cabo Adventures has a stellar training program, with the most advanced technology on the market, and with its guides undergoing 120 hours of rigorous pre-tour training. Experience is key: the thoroughly trained staff were instrumental in the first Canopy tour set up in Costa Rica 10 years ago. They are absolutely dedicated to the protection and preservation of this protected biosphere, with its rivers, lagoons and waterfalls—as well as to its excited exploration by Canopy clients. Take in some pulse-stopping views of one of the most ecologically unique spots on earth—this is eco-touring at its very best! Guests with a history of seizures, vertigo, back or neck injuries, balance or heart problems and pregnant women are not permitted on the tour. 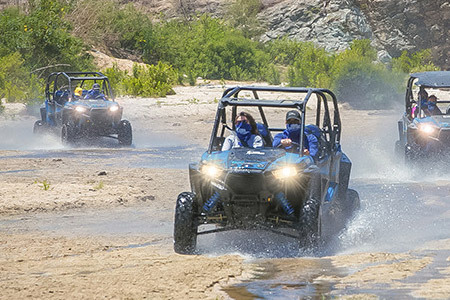 Experience the power and excitement of the sporty Polaris UTV vehicles. 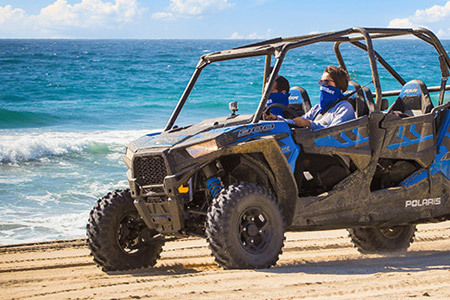 Explore the Baja Outback aboard a powerful four-seater UTV. 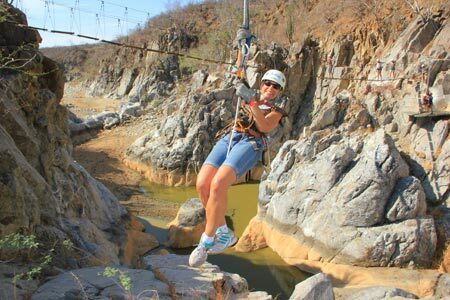 Maneuver through breathtaking canyon trails and over mountains and beaches in a completely untouched area of Baja. On this excursion, you will also discover the fauna and flora native to the region with a knowledgeable expert guide. Finish your adventure with rational Mexican sopes at a beachside bar, located just a few meters from the waves breaking on the Pacific shore.